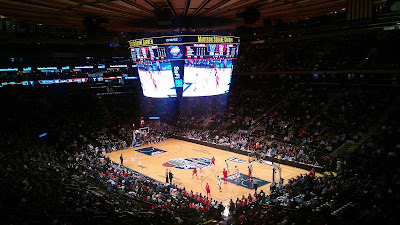 St. John's hung in for the first four minutes, trailing just 9-6 on a Marcus LoVett jumper. From then on, it was all Villanova, starting with a 12-2 run capped by a Jalen Brunson layup at the 10:51 mark to make it 21-8. Another 12-2 run by Villanova, capped by Donte DiVincenzo free throws at the 3:45 mark, made it 40-18. DiVincenzo had 15 points (4-5 FG, 2-3 threes, 5-6 free throws) off the bench to lead the Wildcats in scoring in the first half. After Malik Ellison made a jumper for St. John's with five seconds left, Villanova's Kris Jenkins calmly came down the right side to drain a three at the buzzer to make it 52-26 at the half. Jenkins had 14 points in the first half. Villanova continued to dominate in the second half, maintaining a 30-point edge. They led by as many as 43 points, 108-65, on an Eric Paschall three-point play with 58 seconds left. Villanova was led by DiVincenzo, who had 25 points on a superb 7-8 from the field, 5-6 on threes, five rebounds, and four assists. Jenkins finished with 24 points (8-18 FG, 5-13 threes), Paschall had 17 points (6-7 FG, 2-3 threes), Josh Hart had 15 (6-10 FG, one three-pointer), and Jalen Brunson had 14 points (5-8 FG, 2-4 threes). For St. John's, Marcus LoVett (6-11 FG) and Bashir Ahmed (4-7 FG, 2-3 threes) had 12 points each. Shamorie Ponds (3-10 FG, 2-4 threes) and Amar Alibegovic (3-5 FG< 2-3 threes) had nine points apiece. Villanova Head Coach Jay Wright said of the game, "Really proud of our performance, obviously. And I want to give St. John's credit for the season they've had and last night. They did a hell of a job last night. That was a pretty beat up team, tired team that we played. "I thought the game they played last night was gutsy old Big East game, pretty cool to watch. "And they've done a great job with that team this year. A lot of young guys are going to be really good. And I think we played like a mature team today. "I think -- we have seniors. Josh Hart. Kris was outstanding offensively, but Josh Hart just set the tone defensively on the boards, getting shots for his teammates, not trying, not trying to do too many things, not trying to prove he's player of the year in the conference, just going out there and playing for his teammates. "I thought that was really impressive. And obviously Kris was great offensively, and Donte just continues to get better for us every day." Wright said of getting a big start against St. John's, "You know, I just want to talk about maturity. You watched that game last night. That was a pretty tough game. "If you're smart and you're experienced, you realize that team can come back, and they're playing with a lot of emotion that can beat you. But that team could be tired if you come ready to play. And if we wouldn't have come ready to play, they were ready to get us. But we were very prepared and rested. I think that was the difference today." Mullin said of his team hitting the court so quickly after their win over Georgetown, "Quick turnaround, but that had nothing to do with it. Villanova is one of the best teams in the country. So give all credit to them. And we welcome that. That was a good position to be in, to be able to play in today's game. So no regrets." Mullin said of the progress his team made this season, including seven wins in Big East Conference play in the regular season, "Yeah, improvement; progression, individually and collectively. And lots to look forward to." On what has to happen next season to take the next step, "I think defensively we need to improve. I do think a lot of that will come with strength and maturity. I think a lot of people, me included, players improve a lot in the offseason. That's the best time to do it. "But I also think probably, more so in the college game, like, when they're in summer school and they're around each other. It's a really good time to develop team chemistry. And so I think having more guys playing with each other, working out together in the summertime will be another part of something we haven't had. "And you look at the really, really good teams, Villanova being one of them, they've got experience. Game experience. They've won and lost together, and they've spent summers together."